We should declare an interest from the start – we are massive rugby fans! 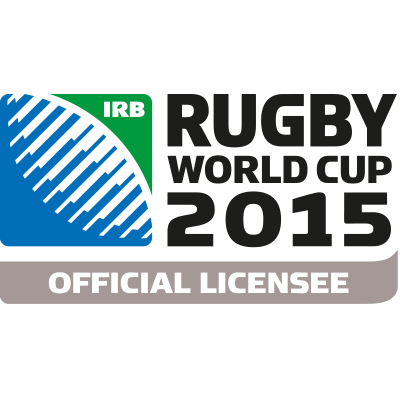 So we were totally delighted to secure a license for England 2015. This tournament was the biggest, best funded, most well attended and watched Rugby World Cup ever with an estimated 4 billion global TV audience. The Webb Ellis Cup has been the prize of rugby nations since the first tournament in 1987. In 2015 the rugby family journeyed home to England and the birthplace of the Game. Securing the bid to design and supply the medals for England 2015 was a defining moment. We believe our ability to adapt to a changing brief and generate alternative creative solutions was a key factor in our appointment. The development process took a convoluted path to accommodate the views of the many stakeholders including World Rugby, England Rugby and the RFU. All were agreed on one thing from the start; the medals had to be made in England and showcase English design and engineering innovation. 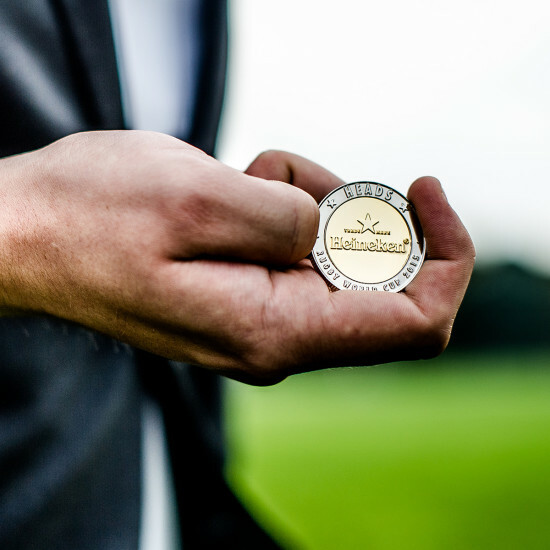 In September 2015 we delivered the two types of tournament medals; the Finalists Medals (gold, silver and bronze) and the Participants Medals awarded to all the players. 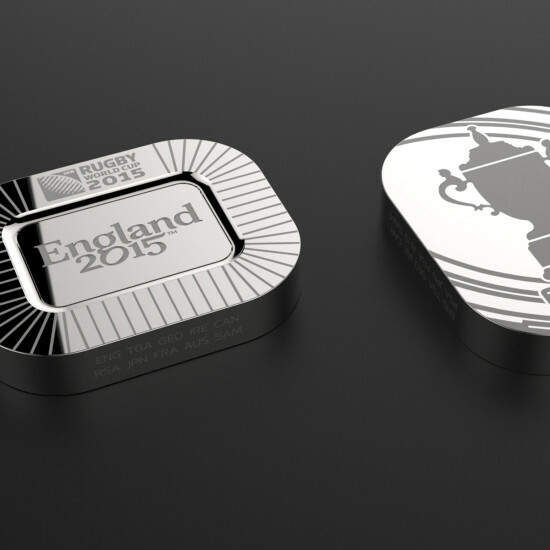 In addition, we created the Helpers Ingot awarded to key staff at the stadiums and Team Bases who ‘Made it happen’. 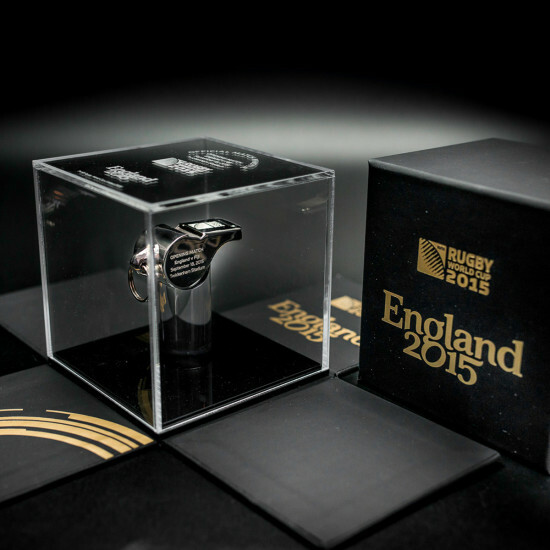 Our merchandising engagement broadened as the tournament approached; we supplied the Team Gift at the twenty Welcome Ceremonies, the special solid silver engraved whistle that was blown at the opening match at Twickenham, the individually marked coins for the referee coin-toss in association with Heineken and special chrome plated rugby balls intended for the opening ceremony. In addition we were able to shape the look and feel of both sponsors VIP passes and guest pouches and proposed a number of innovative gift concepts. We are proud to have been involved with England 2015; here are our most memorable moments…. ‘William Webb Ellis gave rugby to his school in 1823. And then he gave it to the world’. For the first time in Rugby World Cup history players received their participants’ medals along with their caps at the Welcome Ceremonies. Traditionally this medal would be a straight sided coin but we were determined this one would be different. 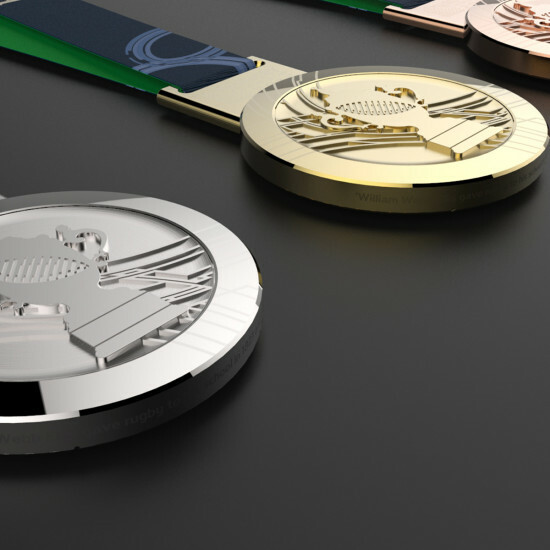 Each medal body is machined from solid stainless steel with a truncated cone form to give it a muscular shouldered look. A polished stainless steel etching features the event mark on the front whilst a tooled leather insert features the tournament script on the reverse. Each one is laser engraved with a unique number. The medal is heavy, tactile and very stylish. The brief was for a stand-out recognition gift from the organisers to key members of staff at the Team Bases, training venues and stadiums. The design should be distinctive and relevant to the staff and the tournament. We chose to create an ingot with the iconic rectangular form of Twickenham Stadium. The top features the tournament script cut into the ‘pitch’ surrounded by the distinctive ribbed roof of the stadium. The reverse of the ingot features the Webb Ellis Cup along with the caption; ‘I made it happen’. The ingot which is solid die cast zinc has an attractive polished silver nickel plate with the pitch area contrasting matt finish. This is a smart keepsake of the tournament. For the first time during a Rugby World Cup, a famous old whistle stayed in its display case at the New Zealand Rugby Museum in Palmerston North. The sport’s governing body, World Rugby, decided to replace the Gil Evans whistle which a referee has blown to start the opening game of all seven previous World Cups. The important brief to create a replacement required careful handling. We secured a license to supply the famous Acme ‘Thunderer’, a venerable product with a long historical connection to English rugby and the whistle of choice among professional referees. We produced a solid sterling silver Thunderer and laser engraved the body with the event mark and tournament script. An inscription ‘England v Fiji, 18 Sept 2015’ states that the whistle was blown to start the opening match of England 2015. The whistle, which now resides in the Rugby Museum Twickenham, will be blown to start all future opening matches. Visitors to global sporting events want to take away a piece of the action, something that has real gravitas and meaning. What better keepsake of England 2015 than this! 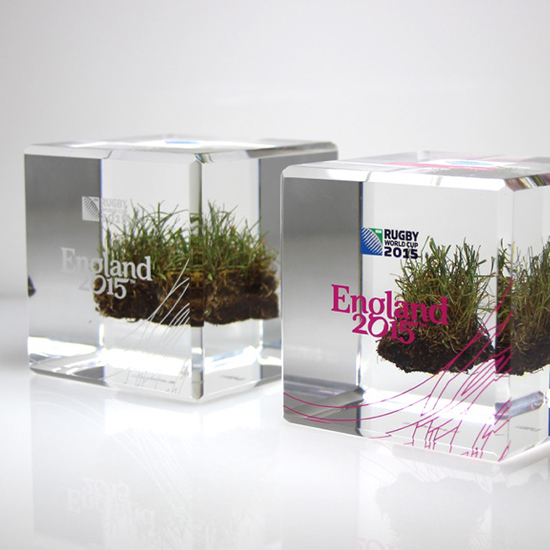 We proposed to encapsulate Twickenham turf cores from the stadium, hermetically sealed in a block of crystal clear cast acrylic. The turf remains ‘frozen’ for all time, staying fresh and green as the day it was potted. 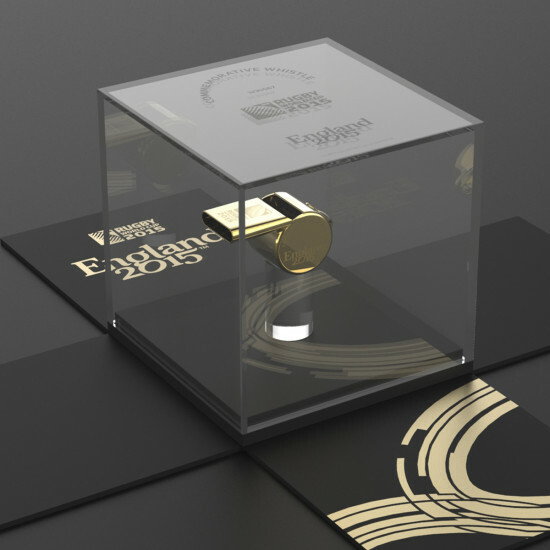 The acrylic cubes featured colourful silk screen printed event marks and unique laser engraved limited edition numbers making them a truly premium gift any VIP guest would cherish. It’s a tradition for the host nation to present a special gift to each of the 20 competing teams at their Welcome Ceremony. For an extra special welcome in 2015, England hosted the ceremonies in different iconic and stunning locations around the country. Amongst the formal speeches, gifts were exchanged and we were asked to create something unique that would be gifted by the host to each of the team captains, personalised with the tournament mark and the 20 Union crests. 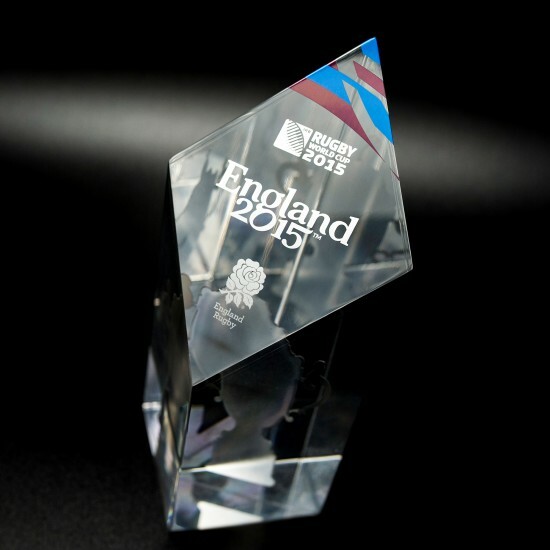 We designed this trophy in the form of a crystal clear shard of solid acrylic. A gleaming stainless steel profile of the Webb Ellis Cup is suspended inside the shard; a symbolic reminder of the goal of the tournament and a reference to the historic origins of rugby in England. When you look at it, it’s just a whistle. But this one is the world famous Acme ‘Thundered’ made in Birmingham, the whistle of choice amongst professional referees and the same whistle used throughout the Rugby World Cup. We provided the stunning Opening Match Whistle in solid sterling silver which will now be housed in the Museum of Rugby Twickenham until required for the next World Cup in Japan in 2019. We produced this limited edition version with unique serial numbers in gold plated solid brass, a very unique keepsake of the tournament. So not just a whistle then but a piece of jewellery with real historic connections and values to English rugby. 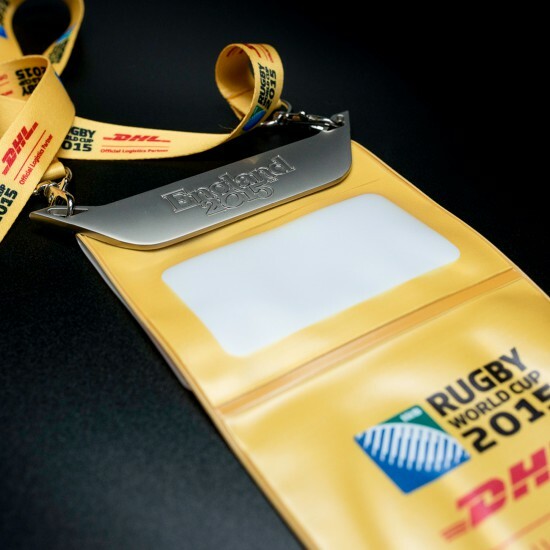 DHL, the global logistics specialist and sponsor of RWC 2015, wanted a smart pouch designed for VIP guests visiting the tournament. As well as a guest welcome pack and itinerary, DHL wanted the pouch to present match tickets in a smart and useful way. Working through their agency, we developed this unique pouch featuring a premium die cast metal hanger bearing the England script logo. The hanger transforms the pouch into a high end visitor pack that guests would want to keep as a reminder of their visit to the tournament. Particular care and attention was given to the design of the pouch so that the ticket could be scanned without requiring removal from its protective pack. RWC 2015 wanted a VIP pass they could offer to the sponsor guest programme. The pass needed to be a standard design that sponsors could personalise with their own branded lanyard to set them apart. A set of 48 match day passes were required covering all the games from the opening match on the 18 September through to the final on 31 October 2015. Working alongside RWCs agency we proposed a unique solution using a moulded rubber pass made to appear like a panel of a Gilbert rugby ball, featuring a pure white base colour and special grippy textured surface. The raised 3D moulded match graphics formed a vibrant relief unique to each match of the tournament. To invest the pass with a premium look and feel we designed a polished chrome metal lanyard hanger making this an object the tournament organisers were proud to give and VIP guests would want to keep. 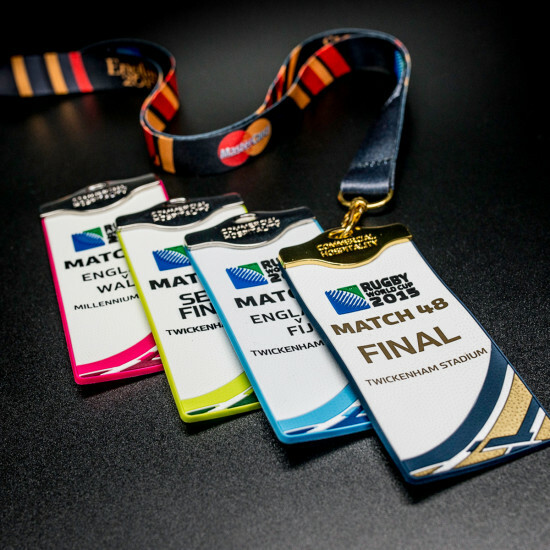 A special gold coloured hanger featured on passes for match 48, the final, to give it special status. 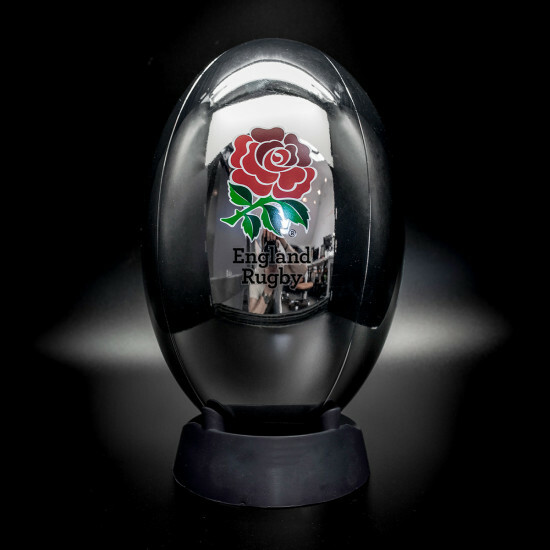 Originally conceived as a display piece for the opening ceremony, these amazing chrome finished rugby balls were to be held aloft by 20 rugby legends of the game at Twickenham Stadium. In fact they proved a little too heavy for the purpose (weighing a hefty 6kg each) so the event organisers replaced them with standard Gilbert rugby balls. This was a shame but they looked so smart that the organisers decided to display all 20 chrome balls together in the VIP lounge reception area to form a stunning centrepiece. The ball was made by casting in silicone rubber from an original Gilbert rugby ball, hence the panelled construction lines. Each ball featured the Union crest of the 20 competing nations. Heineken, the official supplier of drinks to the Rugby World Cup, sponsored the coin toss that was made at the start of each match by the referee to decide the kick off. We demonstrated to Heinekens agency that we were well placed to supply the coin and manage its production. 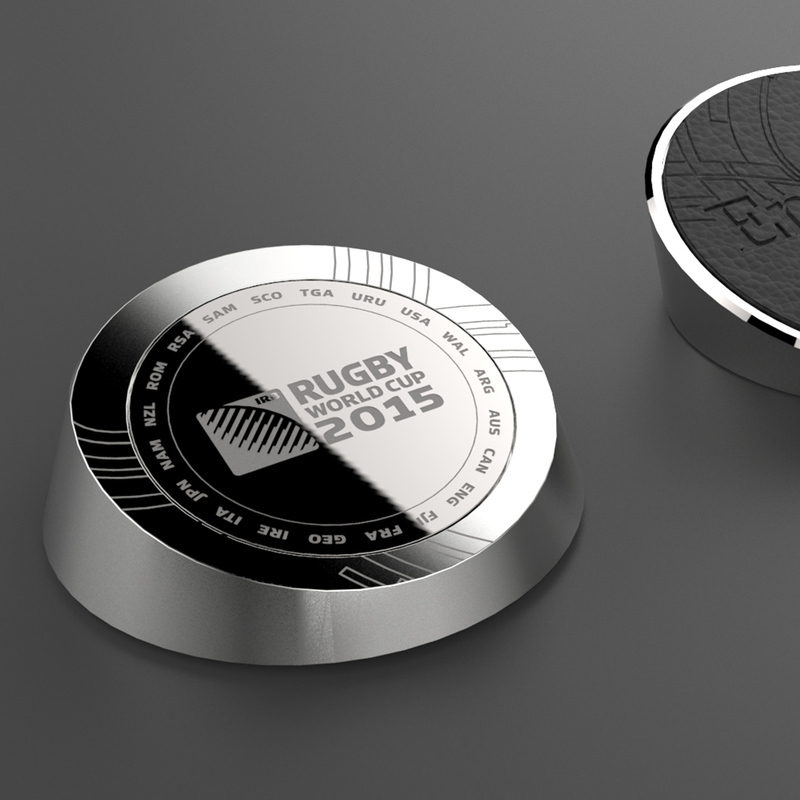 The most challenging aspect of the project, beyond making the coins to a very specific design and specification, was unique match day engraving details required for each coin. As the tournament progressed beyond the pool games into the knock out stages, we only had a window of 48 hours to engrave the team details onto the coins and deliver them to the relevant stadium. In all we produced 2000 coins, each with a unique engraving.